Back in 2011 I took part in a craft show at the Gladstone Hotel. 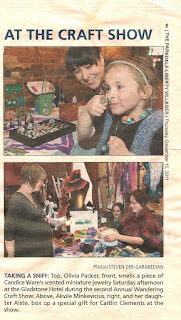 I had no idea that I was going to be in the Parkdale -Liberty villager paper. A family member saw the photo of me in the paper and just had to tell me about it. So here is the news paper clipping of the article.